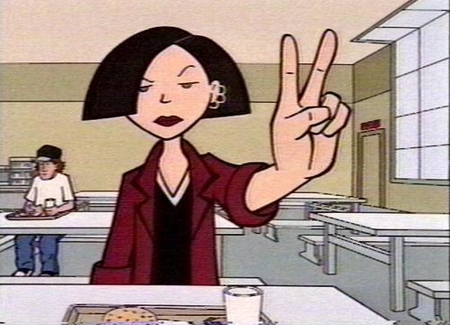 What characters from Daria are we attracted to? David L. Coddon of the San Diego Union-Tribune described Daria as "the anti-cheerleader, the un-social climber, the jaundiced eye in a cartoon world of too much makeup and superficial crayon colors." Coddon added that Daria "may look like a misfit, but the catch is that Daria's the only character on the show who 'gets it.' It's everyone else who's a misfit." Daria states in the first episode that she does not have low self esteem: she has low esteem of everybody else. Anita Gates of The New York Times said "The secret of Daria's popularity (everywhere but in her own home and school) may be our collective alienation." Gates says that "her tastes are a little dark." As an example, Gates used the fact that she reads "Howl" by Allen Ginsberg at a reading to the elderly program. I have now started watching Daria inspired by this topic. I just love Daria so much. I love how she is so calm, confident, and anti-everything. It's adorable!!!! Not to mention, she has like the SEXIEST body EVER! Yeah. According to the show she's supposed to be ugly. The thing is, all of the "hotter" characters have the worst personalities. Most of the other characters facially seem to always be making the same kind of expression. Usually nauseatingly happy, self-important, or ignorant. Daria always has this bored kind of above-it-all expression that fits with her smartass remarks. I love the episode where she visits the plastic surgeon.